The Pop Up Gesture Store is a different kind of store. We “sell” embodied temporal experiences not objects. Our currency is not cash but “Gesture”. The main content of the encounter is a movement-based dialogue, with it’s aim is to come closer to each other and is achieved by way of getting to know each other. The Socially Engaged Performance project looks into value, power, connection and trust. Customers enter The Pop Up Gesture Store not to consume goods and services but rather to partake of embodied temporal experiences direct from artist-shopkeepers. Visitors to this “dancing” store select instantaneous live-performance encounters (3′ to 10’in length) from a list of movement- based gestures built on dance, touch and words, paying in the store’s own Gesture Currency. Transactions are complete only once patrons reciprocate performances with their own immaterial gestures. 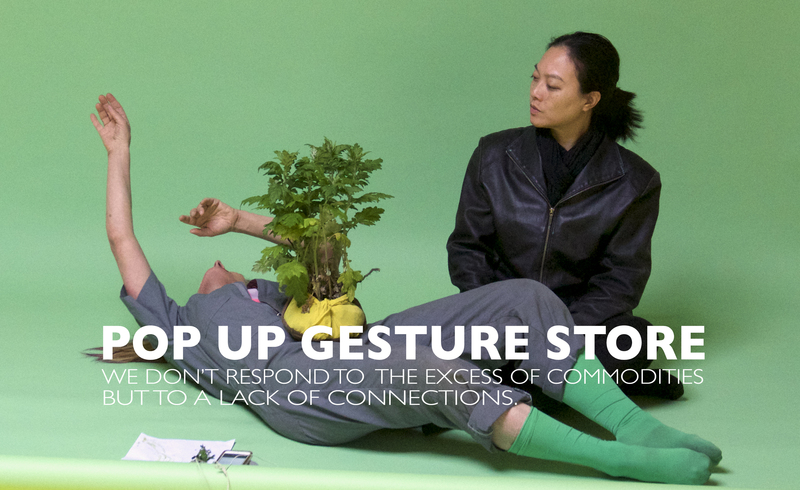 Through an curatorial open call 4-6 Performance Artists are invited to participate in the Pop-Up Gesture Store who develop their performance encounter through a “gesture” training workshop, which is let by Andrea Haenggi in collaboration with Carrie Ahern. IDEAS.TED.COM Explore ideas worth spreading HOW SHOULD I PAY FOR ART? Emily McManus.2016. Artist and choreographer andrea haenggi performs for a customer the live-performance encounter “The plant has a question for you?” The customer will pay her back with a “gesture” that they come up in the moment.